It is a tough task for any basketball player to live up to the legacy of Michael Jordan, let alone as a member of the Chicago Bulls. However, Derrick Rose has managed to lay the groundwork for his own storied career in the Windy City despite high expectations and the lingering shadow of Jordan. Although Derrick Rose cards have cooled during his injury issues, there is reason to believe that values will pick up as he regains his form and pursues a championship. 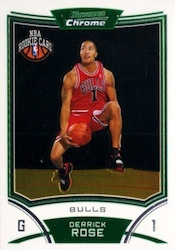 After one season at the University of Memphis, Derrick Rose made his move to the NBA where he was taken first overall by the Bulls. The exciting point guard was near the top of the NBA hierarchy for several years until injuries began to take their toll. The 2009 Rookie of the Year and 2011 MVP seemed primed for something even bigger until multiple injuries caused him to miss over 220 games between 2011-12 and 2014-15. Still only in his mid-20s, Derrick Rose has plenty of time to re-establish his upward trajectory, but his history with missing games due to injury remains a red flag for collectors. Collectors will feel better if Rose can remain on the court consistently and notch his first full season since 2010-11. 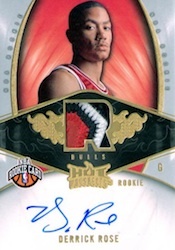 There are nearly 30 Derrick Rose cards that carry the rookie designation, falling across all price ranges. 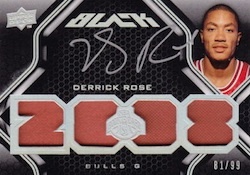 The top three Derrick Rose cards all feature on-card autographs and jersey swatches. Sweet patches, on-card autographs and a print run of just 99 copies put the Exquisite rookie card in the number one spot for collectors. 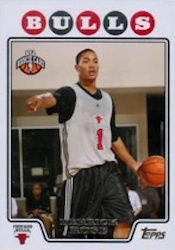 This is easily the most desirable of all the rookie Derrick Rose cards. 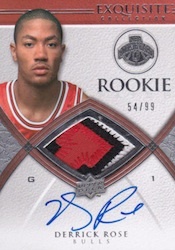 A larger print run of 299 and a small patch keep Rose's SP Authentic rookie from the top spot, but the autographed card is still a hot commodity amongst collectors. It features a nice action shot of Rose and an appealing design. 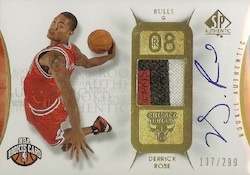 As an added note, the retail version of the card looks very similar and also features Rose's signature. The UD Black card shares the distinction of lowest print run along with the Exquisite, SPx and Upper Deck Radiance. The card includes a large jersey patch that spells out 2008. Foil further highlights the design. The card is unique because it is the only one that features a silver Rose signature. His other autographed rookie cards are signed in blue. 2014-15 NATIONAL TREASURES TIMELINES DERRICK ROSE BULLS JUMBO JERSEY PATCH 99! 2014-15 IMMACULATE BULLS DERRICK ROSE BUTLER NOAH PRIME TRIPLE JERSEY PATCH 75! 2008 Topps Derrick Rose Kevin Love Dual Auto Red Rookie PSA 10!